Week in Review 27: 05/07/2013 Excellent for weather and shark activity. Well this week was excellent for weather and shark activity! With exception of one bad sea day we have had excellent days out at Shark Alley with the Great White Sharks. Sunday was like a summers day with warm sunny calm conditions. The boats went to the Island and had at least 12 sharks per trip. The visibility was excellent at 12 meters so excellent for photography! Monday saw a change in weather with windy conditions with a swell but the sharks were preforming with up to 16 different sharks spotted on 1 trip alone. The visibility was still excellent at 8m and a bonus of a visit to one of the boats by a Southern Right Whale. Tuesday was overcast with drizzle and the boats split between the Island and the beach. For some reason there are still sharks by the beach at this time of year which is very unusual as they are normally here just in the summer months. The boats at the Island had 7 Great White sharks around the boats and the boats at the beach had 9 different sharks around the boats so successful in both dive locations. On Wednesday the boats again split and both locations were excellent with 12 sharks at the Island and 7 at the beach with the better visibility being at the Island at 10m. We were off the water on Thursday due to strong easterly winds (normally a summer wind) but fortunately it was only 1 day and Friday with cloudy but calm conditions with up to 13 different Great White sharks seen on any one trip. The visibility as still great at 8m so excellent for photography! Saturday saw a new cold front coming in but 2 boats managed to go out early before the big winds came. 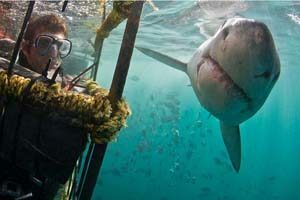 The boats had 8 different great white sharks and 8+ meters visibility again and very happy clients. The week started with a bump with poor conditions in False Bay. The first day we could get out was Tuesday and we had to shoot straight to the Island and then anchor up on the lee of the Island to shelter from the swells and rough seas. The visibility was not too bad a 3m and we had 6 sharks that came to the cage. Unfortunately the conditions were not good for viewing predations or breaching using the decoy. The conditions on Wednesday were much better and we were able to look for predations and breaching. We saw 4 Predations and 2 breaches on the decoy followed by cage diving with 6 different Great White sharks. We also managed to squeeze in a couple of excellent dives with the cow sharks in False Bay in the afternoons. Well what a fantastic week on the run! The beginning of the sardine run has been fairly quiet for baitball activity but with plenty of opportunities to snorkel with the hundreds of sharks, dolphins and Whales in the waters along the coast. Sunday was excellent with 3 bait balls with plenty of sharks, dolphins and Gannets. The action was intense but short lived and died off after around 20 minutes. Monday saw another 3 bait balls with intense action, the Sardine Run is really starting to warm up now! Tuesday was yet another successful day on the Sardine Run with anchovy balls and lots of underwater activity. Wednesday was not a good sea day but Thursday we were back on the water again for more bait ball action! One of the boats had 6 Sailfish on a baitball and it is all about timing and luck and their luck was certainly in today!! Unfortunately it was a little rainy and dull so not great conditions above the water. Friday yet again did not disappoint with fantastic baitball activity with multiple shark and dolphin encounters, and of course the 100+ Whales passing up the coastline each day. Saturday AGAIN.. was amazing with a large bait ball being hunted by 200+ sharks, hundreds of Gannets and as well as lightning quick Tuna rushing up from the deep!! Limited dives at the moment due to all of the focus being paid on the Sardine Run down the coast in Port St Johns but Raggie season is in full swing so great dives all round! The cage diving is going well with many sharks on each dive and we even saw the Scotland Rugby team on the dive this week. Revolution Slider Error: Slider with alias review-of-week-27 not found.